Accord is a responsive multipurpose Magento theme which is fully customizable and suitable for any kind of Magento store on any device. This responsive theme is a general purpose responsive theme which can be highly customized and tailored for any heavy Magento store. This Magento theme comes equipped with a multi level full width menu that allows you to display all the major categories for your visitors. A custom block is also available if you need it. Social bookmark block is added in footer. You can add your social links from admin panel. 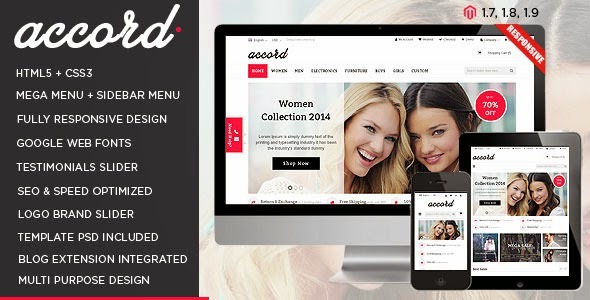 Item Reviewed: Accord Responsive Multipurpose Magento theme 9 out of 10 based on 10 ratings. 9 user reviews.